How many and which fluid inclusions in a sample actually decrepitate on heating? 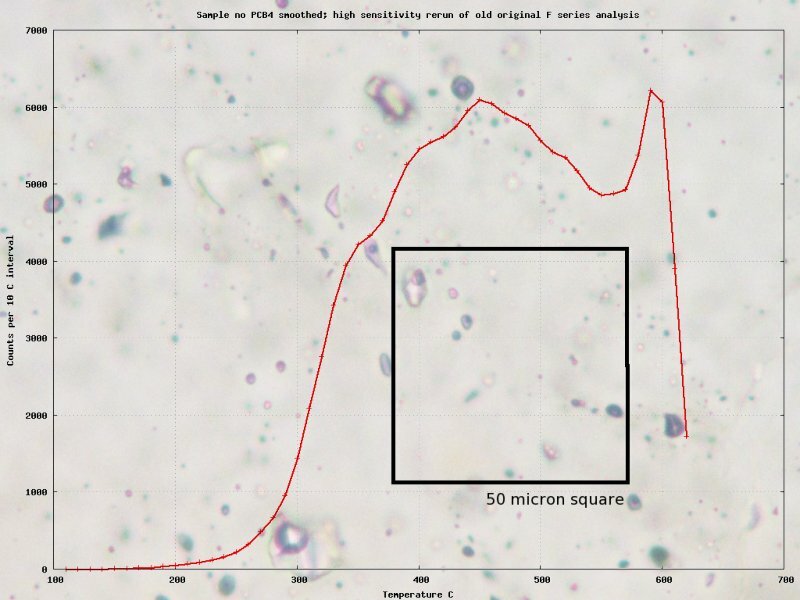 A decrepitation analysis usually uses 0.5 gm of sample, in which there can be in excess of 30 million fluid inclusions larger than 10 microns across and far more inclusions of smaller size. Generally, in quartz, most inclusions smaller than 10 microns across will not decrepitate. And measurements of decrepitation show that only about 0.5% of the inclusions larger than 10 microns across lead to counts in the baro-acoustic decrepitation instrument. However, this still results in 100,000 or more decrepitation counts per sample, providing a statistically meaningful measurement of the fluid inclusions in a sample using this method. The inclusions which do decrepitate are the larger ones and those containing CO2, or those of irregular shape and perhaps only those near grain surfaces or planes of weakness in the host mineral. Although there may typically be some 109 fluid inclusions per gram of quartz, these inclusions constitute less than 0.5% of the volume and trace elements within the inclusion fluids are very unlikely to affect a whole rock analysis. Decrepitation measurements are currently the most effective way to understand a mineral-deposit scale hydrothermal system in a manner which aids in its exploration and further development. 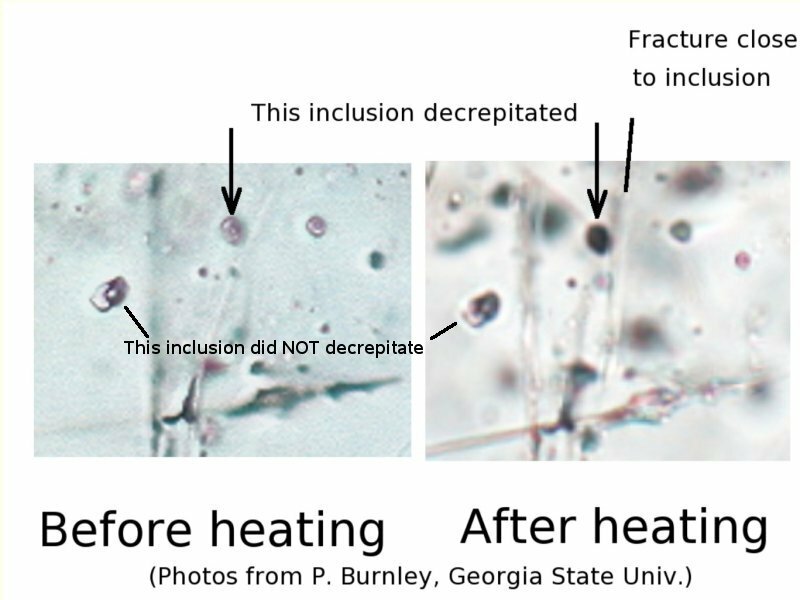 Since the earliest use of the decrepitation method it has been apparent that not all fluid inclusions decrepitate when the sample is heated well beyond the probable formation temperature of the sample. In addition there have been questions about the relationship between the decrepitation temperature (TD) , and the formation temperature (TF) of the sample. Additional confusion arises from the fact that we cannot actually measure the TF and always measure the homogenisation temperature (TH) instead. The TH is the temperature at which all the separate phases visible in a specific fluid inclusion merge into a single homogeneous phase. (Almost all hydrothermal minerals form from what was originally a homogeneous single phase fluid, which only separated into multiple phases as the fluids in the inclusions later cooled down to room temperature.) Using our understanding of the phase behaviour of multi-component fluids, it is possible to derive the TF from our observations of TH. However, the relationship between TD and TF is far more complex as it also depends on the inclusion size, composition and morphology and the crystal structure of the host mineral. This complexity led research workers to favour the microthermometric measurement of individual fluid inclusion TH, rather than use the decrepitation method. To obtain highly accurate temperatures, measurements of TH are indeed preferable to measurement of TD, although such measurements require polished thin sections, are slow and tedious and are prone to problems in extrapolating from one fluid inclusion measurement to the scale of an ore deposit. However, because decrepitation measures a great number of inclusions very quickly, it provides a statistically meaningful result quickly and at low cost, which is ideal for mineral exploration applications. But we need to understand the decrepitation of fluid inclusions to understand how best to interpret the data. Some studies have been conducted to try and determine what internal pressure is required within a fluid inclusion in order for it to overcome the strength of the host quartz crystal and decrepitate. 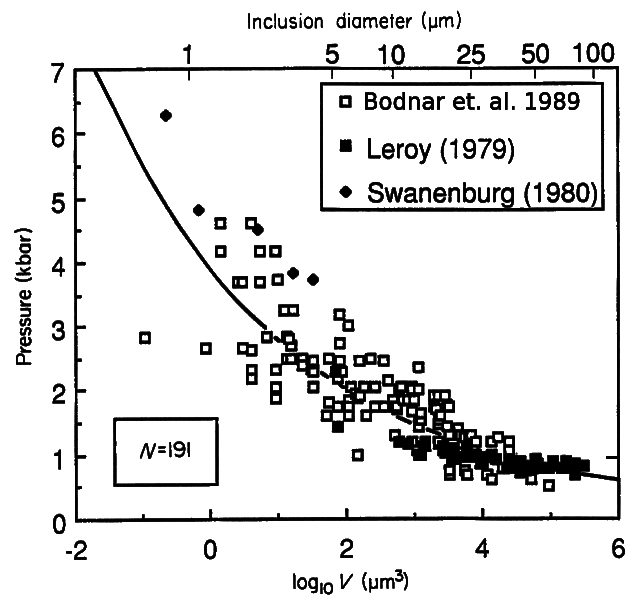 Leroy (1979) determined that the pressure required to cause decrepitation was highly dependent upon the size of the inclusions. He found that inclusions larger than 35 microns across would decrepitate at internal pressures of 800 - 900 bars, which he says agreed with previous work by Naumov et. al.. He also determined that smaller inclusions down to 12 microns across required up to 1200 bars of internal pressure to decrepitate and that even smaller inclusions do not decrepitate even with 2700 bars of internal pressure. Bodnar et. al. (1989) examined the decrepitation of pure aqueous synthetic inclusions in quartz and derived an equation for the relationship between inclusion size and the pressure required to cause decrepitation. 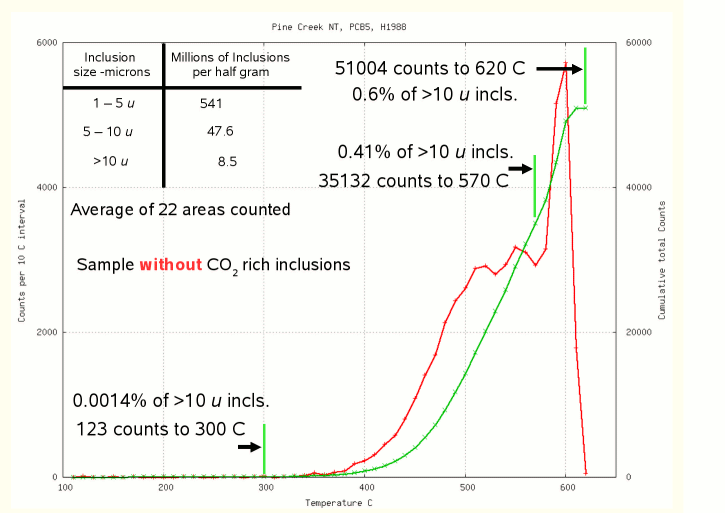 This data was in agreement with Leroy's work for large inclusions and showed that pressures up to 5000 bars were required to decrepitate inclusions as small as 2 microns across. This data is shown in the following graph, showing 191 sample measurements. These works are the basis for the assumptions of decrepitation at internal pressures of 500-600 bars in the explanation of the decrepitation of CO2 rich inclusions compared to aqueous inclusions. To better understand decrepitation behaviour, 4 samples were studied in thin section to estimate the abundance of fluid inclusions and compared with the observed decrepigram results. In each thin section, about 20 randomly chosen locations were selected, using 600x magnification (40 x15). At each location the number of inclusions of various sizes in a 50 micron square area was counted. The depth of field of view was measured to be 5 microns, so each counted area was a volume of 12.5 x 10 -6 cubic mm. No attempt was made to distinguish between primary and secondary inclusions and all visible inclusions were counted. All 4 samples were from the gold producing area of Pine Creek, NT, Australia and sample PCB4 is discussed in detail below, while the complete data set of 4 is shown here. Sample PCB4 contains CO2 rich fluid inclusions, based on the decrepitation curve having significant decrepitation below 300 C, although such inclusions are not immediately apparent in the photomicrographic view shown here. The 50 micron square counting area is also shown. The decrepitation analysis result is shown by the red curve. For sample PCB4, the graph in green shows the cumulative total of decrepitation counts with increasing temperature, there being a total of 162,286 decrepitation events recorded in this analysis. The visual count of fluid inclusions showed a total of some 770 million inclusions per half gram of quartz, but the great majority of these are smaller than 5 microns across. If we assume that only inclusions larger then 10 microns across are able to decrepitate during heating, then the measured decrepitation counts suggests that only about 0.5% of those larger inclusions actually decrepitated and were counted in the analysis. Details of the inclusion counts of this sample and the implications are here. 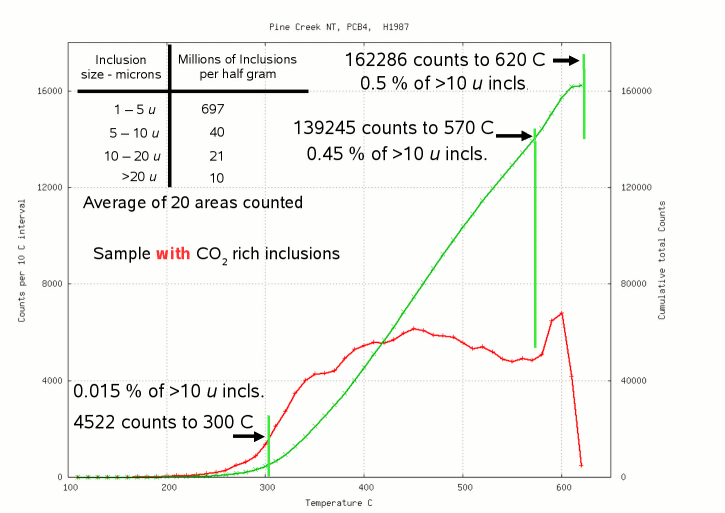 Sample PCB5 lacked any significant content of CO2 rich fluid inclusions, shown by the very low counts of only 123 up to 300 C. The total decrepitation counts up to 620 C is about 0.6% of the number of inclusions larger than 10 microns present in the sample. Although fluid inclusions are very abundant in these, and most quartz samples, only a very low percentage of them decrepitate when heated beyond their original formation temperatures. For small inclusions, the quartz host mineral is strong enough to prevent decrepitation even though there may be quite high internal pressures of about 5000 bars. Most of the larger inclusions will also not decrepitate, so long as they do not contain significant amounts of CO2, CH4 or other gases. (Such gas content of fluid inclusions has been shown here to be a major cause of decrepitation because of the high internal pressures generated in inclusions with significant gas contents.) So there are factors other than inclusion size and composition which must be strongly affecting the decrepitation probability of an inclusion. The inclusion morphology is one of these factors, as there would be a stress concentration at the points of irregularly shaped inclusions. Inclusions of highly irregular shape are frequently observed for CO2 rich fluid inclusions. Another significant factor affecting decrepitation probability is the location of the inclusion with respect to a grain surface or zone of weakness within the quartz. This effect can be seen in the microphotographs below which show the same quartz before and after heating. A small inclusion decrepitated, because it was close to a visible fracture plane, while a nearby larger inclusion did not decrepitate as it was not near a zone of weakness in the quartz. The relationship between measured TD and TH or TF is complex and TD measurements can probably only give approximate estimates of TF. TD depends strongly on the size of the fluid inclusion and its morphology, but is even more dependent on the gas composition of the inclusion. It also depends on the location of inclusions with respect to weakness zones in the host mineral. And many inclusions will not develop enough internal pressure when heated to overcome the strength of the host mineral and will not decrepitate at all. However, decrepitation has several major advantages in studying fluid inclusions. It measures a large quantity of inclusions - frequently hundreds of thousands, very quickly in just half an hour and without the need for slow and expensive doubly-polished thin section preparation. Because it measures so many inclusions, it is a better estimator of the fluid conditions in the whole sample. Although this does sacrifice some detail about microscopically sized zonation within the sample, it is otherwise necessary to extrapolate individual fluid inclusion measurements up to the scale of a hand specimen, a procedure which is potentially erroneous and prone to severe operator bias. In an exploration context, measurement of TD is sufficient to ascertain the presence of important gases within the fluid, such as CO2, which is often a useful indicator of economic mineralisation potential. TD information is also useful as a comparison and discrimination method within a suite of samples. In mineral exploration there is no point in measuring TH to the nearest 0.1 C as is done in microthermometric methods, as hydrothermal systems undergo wide temperature variations both spatially and temporally. Measurements of gold deposition event temperatures in many studies shows that gold deposits over a very wide range of temperatures, from some 200 C to over 600 C, and at varying salinities (though usually low). Making highly accurate temperature measurements merely contributes to the "noise" in a data set and it is best to focus on a measurement such as TD which is easy to make, objective and highly reproducible and which highlights fluid variations for use in outlining anomalous areas worthy of more detailed follow-up exploration. Decrepitation measurements are currently the most effective way to understand a mineral-deposit scale hydrothermal system in a manner which aids in its exploration and further development. Highly accurate microthermometric data is not useful in mineral exploration because it merely measures relatively meaningless tiny temperature differences in a hydrothermal system in which there are very large natural temperature fluctuations. Obsessive concentration on such micro-detail merely obfuscates the important variations occurring at the deposit scale. TF Temperature of formation. The original temperature at which the mineral (quartz) was deposited from the hydrothermal fluid. This cannot be directly measured in the laboratory and is derived from other measurements and inferences about the original sample deposition environment. TH Temperature of homogenisation. The temperature at which the visible phases of a multi-phase (eg liquid plus vapour) inclusion at low temperature merge into a single homogeneous phase. It is usually necessary to measure this under a high powered microscope using a heating stage and a doubly polished thin section of the sample. TD Temperature of decrepitation. The temperature at which an inclusion develops so much internal pressure that it exceeds the strength of the host mineral and bursts open, releasing the inclusion contents. The resulting pressure pulse is detected and measured in the baro-acoustic decrepitation method. Bodnar, R.J., Binns, P.R. & Hall, D.L. (1989), Synthetic fluid inclusions - VI. Quantitative evaluation of the decrepitation behaviour of fluid inclusions in quartz at one atmosphere confining pressure. J. metamorphic Geol., 1989, 7, 229-242. Leroy, Jacques (1979), Contribution a l'etalonnage de la pression interne des inclusions fluides lors de leur decrepitation. Bull. mineral. 1979, 102, 584-593.